This is my 50th post of 52 to complete this challenge to write about family ancestors, at least once a week for a whole year! Great thanks are given to Amy Johnson Crow of the “No Story Too Small” blog on WordPress for issuing and maintaining this callenge! I started participating in the challenge last January, and will soon be finished! It is so hard to believe! I have been wondering for awhile what might be a good way to wrap up this wonderful adventure, and after much thought, decided that it might be fun to end this series (not that I won’t do other genealogical posts) with stories about some of our beginnings–the first of our ancestors in America! 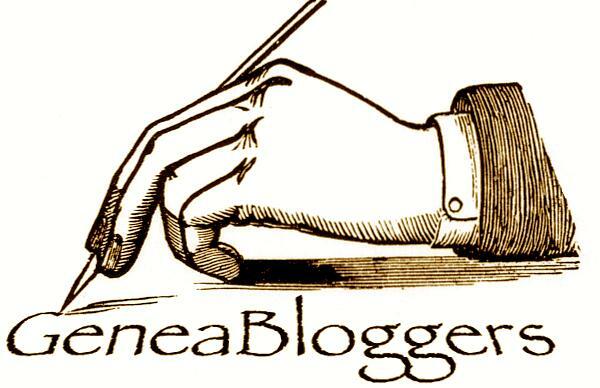 To that end, I have decided to write about our Huguenot Ancestors, our Jamestown Ancestors, and our Mayflower/Plymouth ancestors! It is so amazing to me to know that we have members of our family from all of these groups! It also explains why I am kin to almost everyone! When your family is present in the beginning, there are fewer families, and at that time they tended to have huge families of ten and more children. All those children married others from their church and/or farming community generally, so it didn’t take long for everyone to be cousins! You might wonder why I would even think to write about the Huguenots. 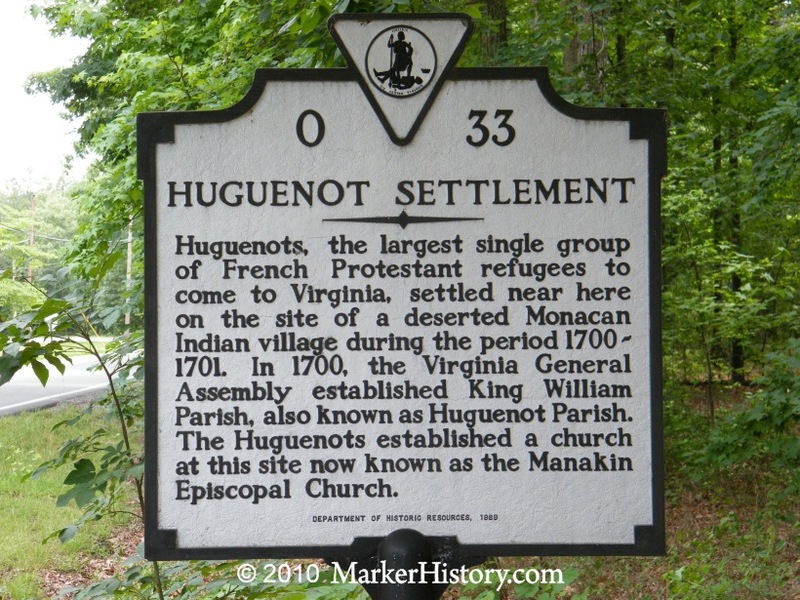 As it turns out, I grew up only a few miles from the original Huguenot settlement in Manakintown, Virginia! I went to Huguenot High School and drove over the Huguenot Bridge almost every day. 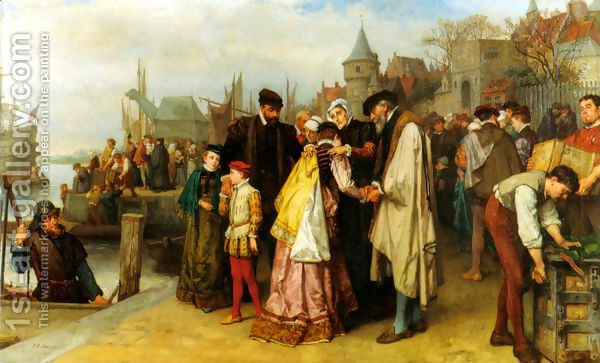 My own families were Methodists, not Huguenots, but as I began my genealogical research, I was pleased and surprised to find I had Huguenot ancestors and so did my husband! “The Huguenots were French Protestants most of whom eventually came to follow the teachings of John Calvin, and who, due to religious persecution, were forced to flee France to other countries in the sixteenth and seventeenth centuries. Some remained, practicing their Faith in secret. The Protestant Reformation began by Martin Luther in Germany about 1517, spread rapidly in France, especially among those having grievances against the established order of government. As Protestantism grew and developed in France it generally abandoned the Lutheran form, and took the shape of Calvinism. The new “Reformed religion” practiced by many members of the French nobility and social middle-class, based on a belief in salvation through individual faith without the need for the intercession of a church hierarchy and on the belief in an individual’s right to interpret scriptures for themselves, placed these French Protestants in direct theological conflict with both the Catholic Church and the King of France in the theocratic system which prevailed at that time. Followers of this new Protestantism were soon accused of heresy against the Catholic government and the established religion of France, and a General Edict urging extermination of these heretics (Huguenots) was issued in 1536. Nevertheless, Protestantism continued to spread and grow, and about 1555 the first Huguenot church was founded in a home in Paris based upon the teachings of John Calvin. The number and influence of the French Reformers (Huguenots) continued to increase after this event, leading to an escalation in hostility and conflict between the Catholic Church/State and the Huguenots. Finally, in 1562, some 1200 Huguenots were slain at Vassey, France, thus igniting the French Wars of Religion which would devastate France for the next thirty-five years. The Edict of Nantes, signed by Henry IV in April, 1598, ended the Wars of Religion, and allowed the Huguenots some religious freedoms, including free exercise of their religion in 20 specified towns of France. The Revocation of the Edict of Nantes by Louis XIV in October, 1685, began anew persecution of the Huguenots, and hundreds of thousands of Huguenots fled France to other countries. The Promulgation of the Edict of Toleration in November, 1787, partially restored the civil and religious rights of Huguenots in France. There is a National Huguenot Society as mentioned above. Apparently there is also The Huguenot Society of the Founders of Manakin in the Colony of Virginia. From them we learn some specific history of the Huguenots in Virginia. “Huguenots began coming to Virginia as early as 1620. 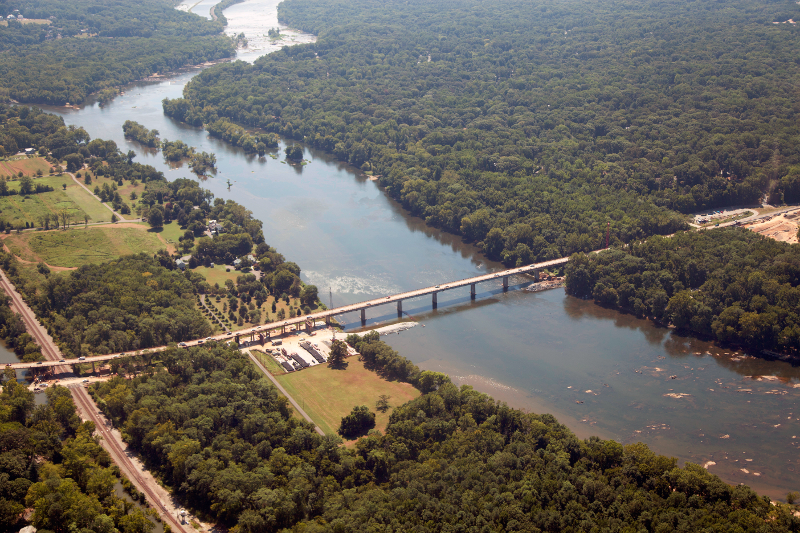 In 1700-1701, five ships arrived at the mouth of the James River, then the York and the Rappahannock rivers, east of present-day Richmond, Virginia. French Huguenots, having fled religious persecution, had lived in England and Ireland and done military services for King William. They were granted lands in the New World for a permanent home where they had the freedom to worship as they pleased. West of Richmond, many founded a colony on the site of a village deserted by the Monacan Indians. This is a society of the descendants of that colony and French Protestants who came to Virginia before 1786 [see history of the society]. The society headquarters and library are located beside the Manakin Episcopal Church on the original King William Parish glebe land in Manakintown. The society convenes for a National Assembly annually (usually in June). For information on membership and branches, contact us by e-mail at manakintown @yahoo.com. Perhaps this explains why I have found at least three different lists of registered lineages or ancestors from the Colonial Huguenots in America. If you are interested in joining one of these societies, be sure that you check all of the different requirements for the one you are interested in joining. By far, my most famous Huguenot ancestor is Nicholas Martiau, my/our ninth great-grandfather and his children,,of whom Mary Martiau Scarsbrook is my/our 8th great-grandmother. The Martiaus are ancestors of George Washington, making us cousins. There is a book written called Nicholas Martiau: The Adventurous Huguenot by John Baer Stoudt. You can read the blog post I wrote about Nicholas earlier at this link. Nicholas was a French engineer who helped build the palisades around Jamestown Fort and the Fort at Yorktown. He served as a Burgess from Jamestown and other places in Virginia. A bust of him, and a plaque to him can be seen in Yorktown , Virginia, today, honoring the gift of his land where the city of Yorktown stands today! Another direct ancestor who was a Huguenot settler in the Colony of Virginia was my/our 7th great-grandfather, John Battaile-b.1658, his son Lawrence-b.1698 and his daughter Elizabeth Battaile-b. 1731 . My/our 5th great grandmother. Elizabeth married George Muse, b. 1722, another Huguenot, and my /our 5th great-grandfather as well! George Muse fought with George Washington in the Revolutionary War. Elizabeth Battaile, 1731-1786, granddaughter of John Battaile, daughter of Lawrence Battaile, and wife of George Muse, 1722-1784. -source sjwilson77 first shared this on ancestry. Dewalt Bieber is listed as an approved Huguenot ancestor under The Huguenot Society of America whose list you can find at the underlined link. He is my husband’s 6th great-grandfather, and my children’s 7th. This is a bit of interesting history about the Bieber/Beaver family in America. “The original family name for Bever/Bieber/Beaver was de Beauvoir. The name was taken by the family in the 10th century from the name of the little city in France where they lived near Rouen in northeastern Normandy called Beauvais. This town was known during the time of Caesar as Caesaromagnus. At the time of the French Church Reformation in the 1500’s, the Beauvoirs accepted the teachings of John Calvin and left the Catholic Church to become Huguenots. Huguenots were a group of Protestants who became the center of political and religious quarrels in France in the 1500 and 1600’s. The French Roman Catholics game them the name “Huguenots”. Most of them were craftsmen and textile workers. During the reign of Henry II (1547 – 1559) the Huguenots became strong in numbers and influence within France. As they grew strong, the Catholic government persecuted them more and more. Many Huguenots were murdered in the Massacre of Saint Bartholomew’s Day on Aug 24, 1572. Michol de Beauvoir escaped from France with a group of Huguenot as refugees and was received into Geneva, Switzerland as a “bourgeois” about one month later on 29 Sept 1572. In 1573 he crossed the frontier and was almost massacred. This obliged him to return to Switzerland. Henry of Navarre became King of France and in 1598 he issued the Edict of Nantes. This law gave the Huguenots freedom of worship in about 75 town and cities. The edict also gave them complete political freedom. The Huguenots thus formed a sort of Protestant Republic within the Catholic Kingdom. The Huguenots lost their political freedom during the reign of Louis XIII. They lost their freedom of worship in 16 85 when Louis XIV repealed the Edict of Nantes. They there were hunted like wild animals and slaughtered in their hiding places. “400,000 were driven out of France until there were no Huguenots left in the land.” Thousand of these fled France to find new homes in England, Germany, Holland and America. Those Beauvoirs who fled to Germany found themselves a dismembered and fugitive family bearing a name which brought back only bitter recollections and burning recrimination. The name in Germany was pronounced “Bieber” and soon they were spelling it in the language of their adopted country. The name Bieber means “beaver catcher”. Some shortened their names to Beber and Bever. Settling in Alsace-Lorraine, Germany brought no degree of peace to the misplaced French families. There was a continual battle between Germany and France over the country and continual friction between the Protestants and the Catholics. Perhaps this helped influence the Bieber/Bever family in their decision to seek a new life in America. In the early 18th century when the shipping agents were working up immigration parties for America, Peter Bieber and his cousin Lorentz Biever, were among those who chose to immigrate to the new World. Peter Bieber left his home in Saarbrucken, Alsace-Lorraine and went down the Rhine River to Rotterdam in the Netherlands where he set sail in 1739 on a ship called “Robert and Alice.” There were 78 men, 57 women and 88 Children on the ship that landed in Philadelphia, Pennsylvania on 3 Sep 1739. This Peter Biever would have been our Peter Bever, Jr. Ship records state these passengers came from Rotterdam via Dover from the Palatinate. The Palatinate is a historic division of Germany. They settled in Pennsylvania. We have many Huguenots in our family who are only kin to us by marriage, or perhaps are distand cousins. These alone wouldn’t get you into a society, but it is interesting to know of our kinship! Martha Patsy Demoss, b. 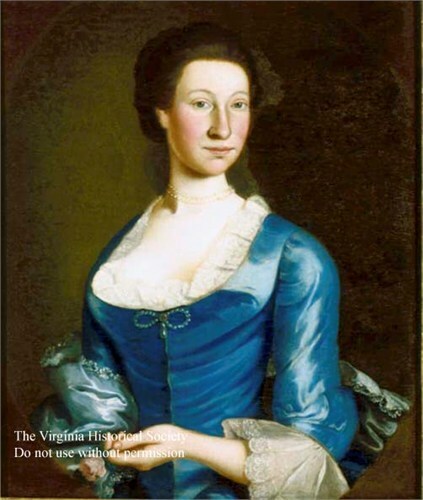 1787 in Virginia, wife of Thomas Youngblood. Anne Beaufort, her daughter Mary Ragland, and her son Nathaniel Bowe Jr. are kin to us through marriage. The DuBois family and the Vias are kin to us in multiple ways, but none very directly–mostly through marriage or distant cousinship. Little did I know growing up that I was the descendant of at least three direct Huguenot ancestors, now my husband of at least one! That means my children could easily qualify for membership in a Huguenot Society I would think. It’s an amazing history! Categories: 52 ancestors' stories in 52 weeks, Huguenot Ancestors | Tags: Battaile, Bieber, French Christmas Carols, Huguenot Ancestors, Muse, Nicholas Martiau | Permalink. Very interesting reading. I’m going to miss your musings! All I can think to say is once more you have crafted a great post. Any plans for a book? Or in your case more than one book? I just found your blog through the Facebook group. Very enjoyable reading, thank you! Hello Vonda Heverly, thank you so very much for taking the time to read and comment! I look forward to getting to know you! H.
Thank you for gathering the Huguenot history. That’s “my bridge” in the photo. My ancestors have been recorded as coming from the same region in France. There’s a nice story that my great aunt used to tell us about “The Little Nightcap.” One day I found her story on the internet! From Richmond, Powhatan, and Farmville, we’re all cousins now! Great to see part on the Muse’s.